Hibiscus flowers are a quintessential joy of summer gardens. One of the largest, brightest flowers we’ll find in our garden, ever, Hibiscus takes its place beside the Magnolia grandiflora for flowers the size of luncheon plates. Hibiscus flowers make us think of tropical vacations, aloha shirts, and rum drinks. They bloom during the hottest, muggiest part of our summer, taunting us out into the garden from our air conditioned shade indoors. 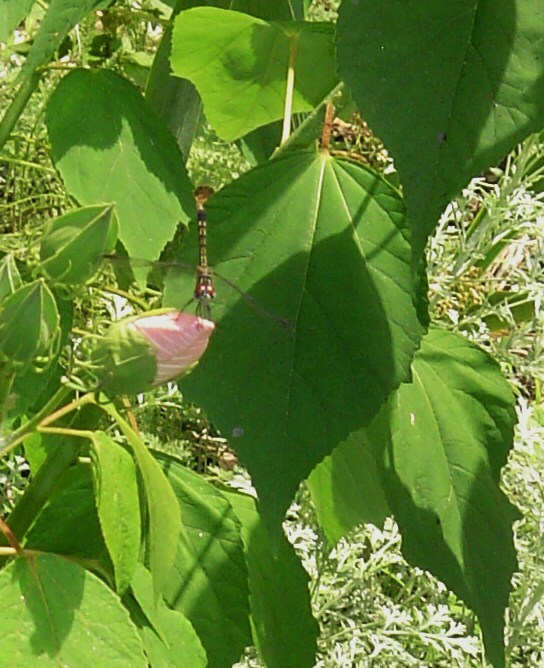 A dragonfly rests on a Hibiscus bud . Loved by hummingbirds, bees, butterflies, and dragonflies, hardy hibiscus are always the center of activity in the garden. Not only are they an important source of nectar for hummingbirds, but they also attract small nectar loving insects which hummingbirds love to eat. Once the flowers fade in autumn, and their seed pods ripen, hardy Hibiscus feed goldfinches, cardinals, tufted titmice, wrens, and other songbirds looking for nutritious seeds all winter. 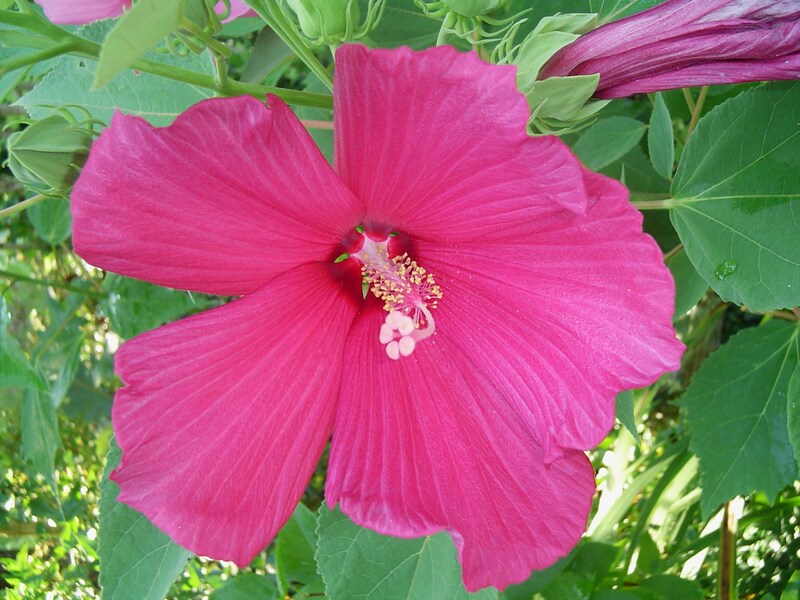 Although big box stores and garden centers offer potted tropical Hibiscus plants each summer, there are several varieties of hardy hibiscus native or naturalized right here in coastal Virginia. In fact, you’ll see many hibiscus, or Rose Mallow, plants blooming in July along the James and York Rivers, and in the marshes along the Colonial Parkway. Our native and naturalized varieties need no pots, no coddling, readily self-seed, and come with an agreeable price tag. The tropical varieties must be brought in before frost or left outside to die; the natives are deciduous, but reliably return the following spring. 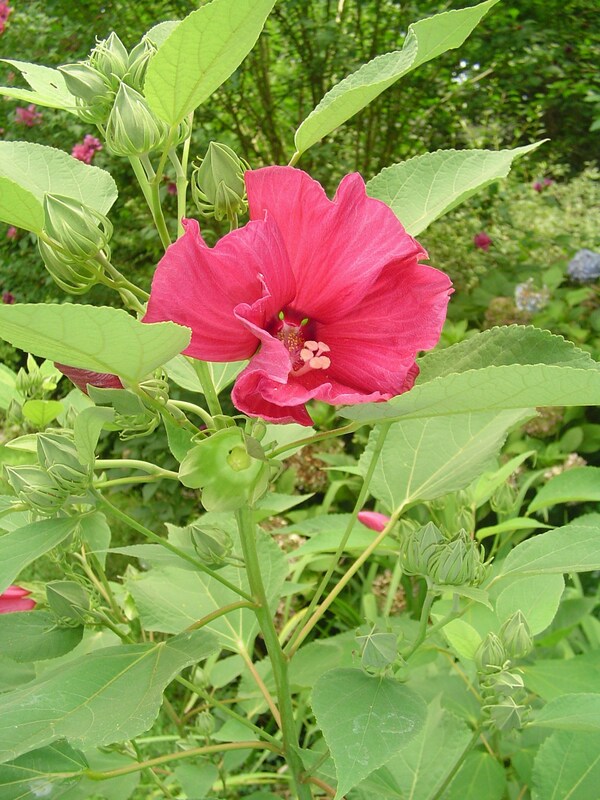 Hardy hibiscus comes in two forms: herbaceous perennial and deciduous shrub. Both leaf out quite late in the spring. 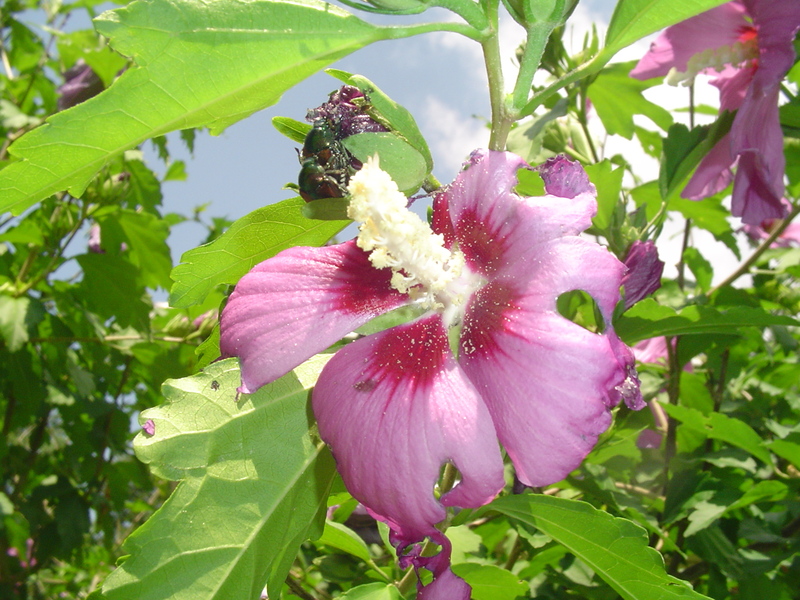 Hibiscus syriacus, also called Rose of Sharon, or Althea, is a deciduous woody shrub. Its first leaves appear in late spring, and it begins flowering in mid June. Flowers continue into September. The leaves turn yellow in autumn and linger until after frost. The herbaceous perennials, which begin sending up their green stems and leaves in mid June, bloom in mid-July and August. 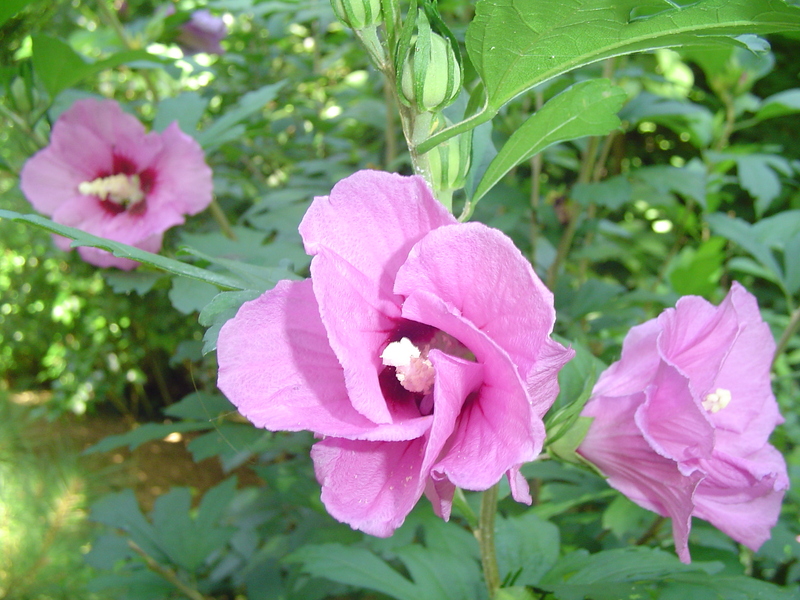 HIbiscus syriacus, or Rose of Sharon, is a favorite nectar plant for hummingbirds and bees. 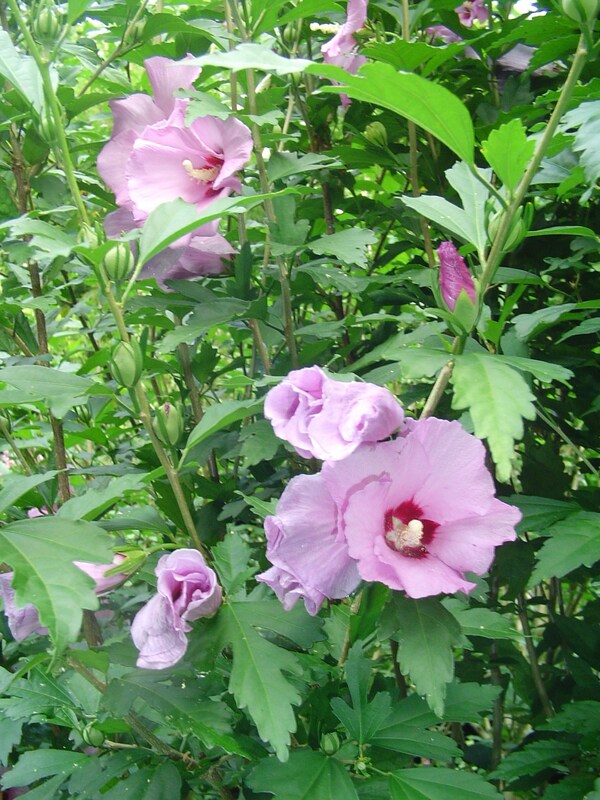 Rose of Sharon is native to eastern Asia, and is the national flower of South Korea. It is so beautiful that it was carried all over Asia and Europe by traders in the 16th century before coming to North America with the English colonists in the 18th century, where it was called Althea Frutex. The flowers are edible, and the Koreans also use the leaves. Growing 8’-10’ tall, and 6’-8’ wide, it is hardy to Zone 5. Rose of Sharon in a mixed shrub border with Hydrangea and Lilac. Rose of Sharon is best used as a back drop for a perennial bed, as a screen, or in a border of mixed shrubs. 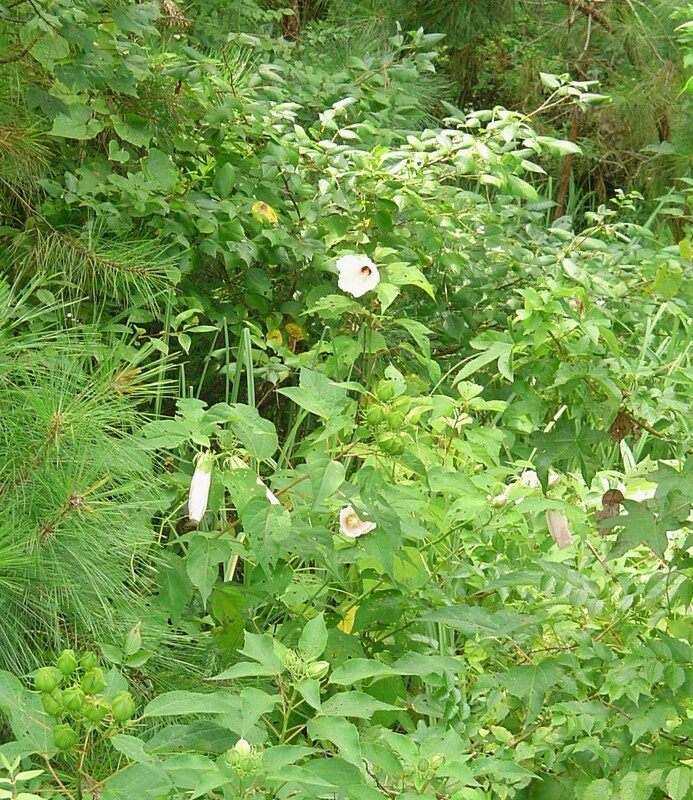 Here several Althea shrubs form a backdrop for the butterfly garden. This vase shaped shrub flowers from June through September in our area. Its flowers are 2”-4” wide, with five petals forming a deep throated flower with pronounced pistol and stamens. The throat is often a dark maroon, and the flowers come in shades of white, pink, and lavender. Some double forms are available, but most of the flowers are single. Each flower lasts a single day, but buds are produced prolifically throughout the season. Flowers form on new wood so the plant can be pruned in autumn or spring. Rose of Sharon shrubs tend to grow very tall and leggy, and so annual pruning helps the plant to bush out and become a more substantial shrub. Mine are sometimes blown over in strong winds, but can be set upright, staked, and they will continue to thrive. Although reasonably drought tolerant, Rose of Sharon doesn’t appreciate too much water or too much fertilizer. Some of my shrubs have simply died over the winter for no apparent reason, while their sisters two feet away survived just fine. Rose of Sharon often doesn’t even leaf out until after the Azaleas have bloomed, so patience is important. Their flowers are worth waiting for, especially if you enjoy watching the beautiful creatures they attract. A bee covered in pollen from the generous Rose of Sharon. That being said, Rose of Sharon is not a good candidate for a “specimen shrub” in the landscape. They are good as the backdrop for perennial borders, although tall ones will sometimes droop over from the weight of their blooms and shade the plants growing in front. They are good planted as a mass, used for a screen, or even used as a foundation planting along a back wall where windows are quite high. 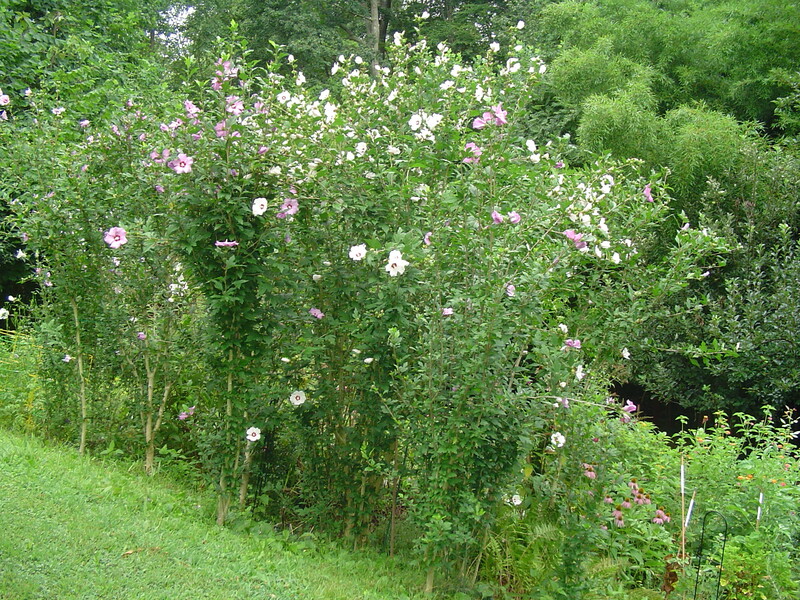 Rose of Sharon work best in a mixed shrub and perennial border. They will carry the hottest part of mid summer when the hydrangeas have faded out but the Camellias haven’t yet come into bloom. 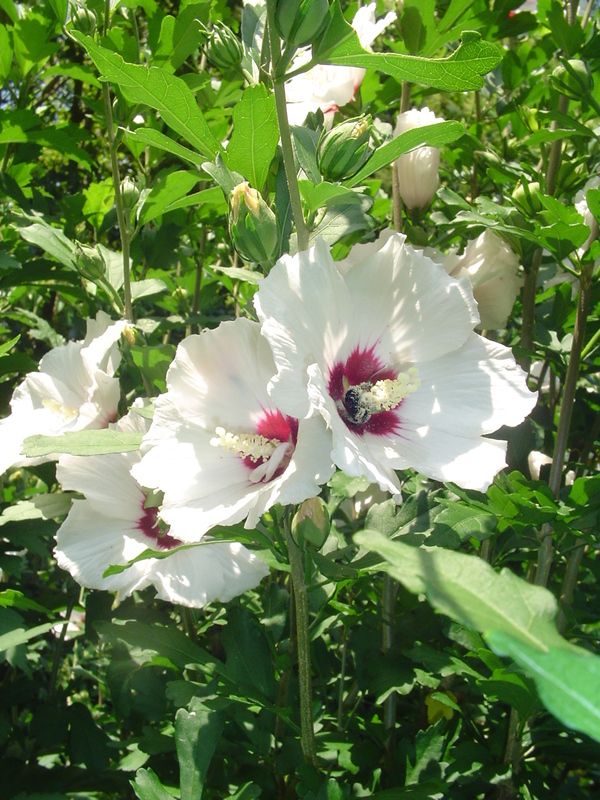 Rose of Sharon produces millions of seeds, and these seeds self-sow wherever they can. It is considered invasive in CT, but not in VA. 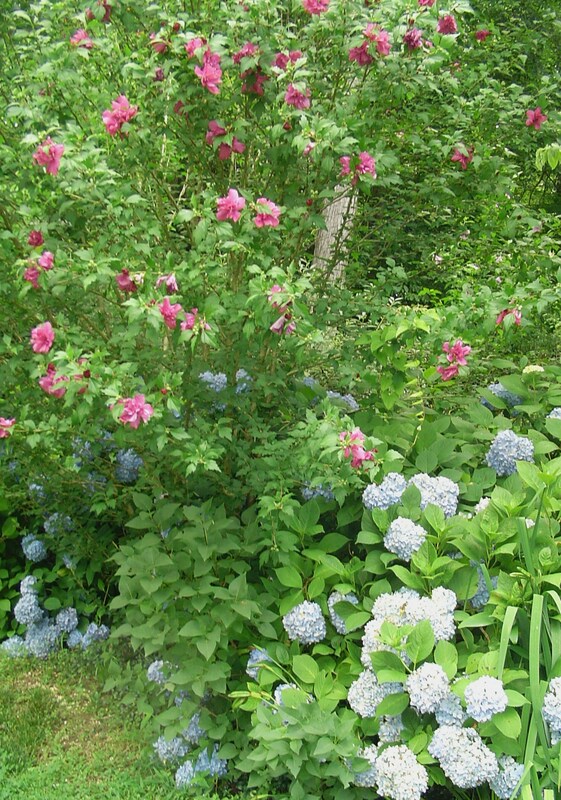 This is a benefit if you want more Rose of Sharon shrubs in your landscape, or have friends who do. They are large enough to identify and pull up by May if you want to discard the seedlings. New plants can also be started by layering or taking green cuttings of new wood in early summer. Japanese beetles will eat Rose of Sharon buds, but can be picked off easily. These tough shrubs will grow in full sun to partial shade in a variety of soils. They grow as well on slopes as on flat ground, compete well with other shrubs, and have very few pests. I’ve seen Japanese beetles munching their flowers, and occasionally a caterpillar snacking on a leaf. The damage done was minor and didn’t detract from the beauty of the shrub. 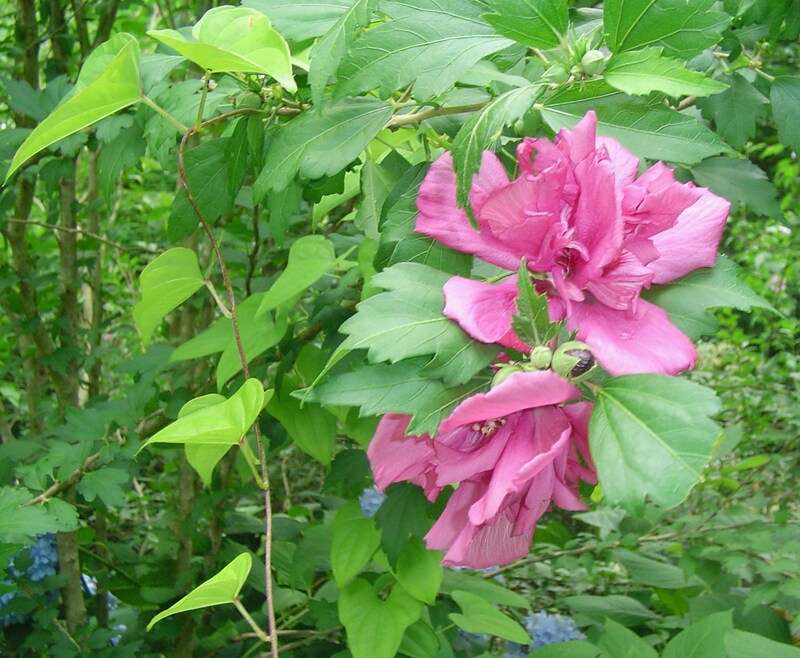 There are actually several herbaceous perennial Hibiscus plants which grow will in our area, although only two are considered natives. Hibiscus Mutabilis, also called Confederate Rose, is native to China, and most commonly grows in the Gulf Coast states in North America. This is a huge plant, sometimes growing to 10’ or more in a single season, especially in frost free areas. Even if it dies back to the ground in the winter, it comes back strong the following summer. It has white blossoms about 6” across which gradually turn pink, and in some cultivars red, over a period of several days before dropping off. Flowers on the same plant will appear in these different colors all at the same time. Flowers can be single or double depending on the cultivar. 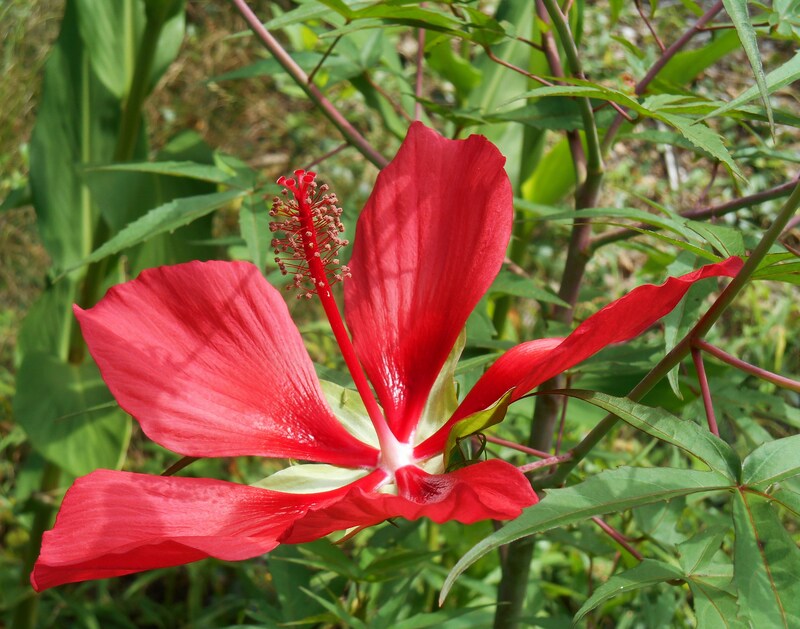 Hibiscus coccineus, native in the Deep South, is hardy to Zone 6b and grows with little fuss or care. Also known as Swamp Mallow or Scarlet Mallow, it can grow in normal garden conditions. This plant has large, coarse, deeply lobed leaves which open late in the season. 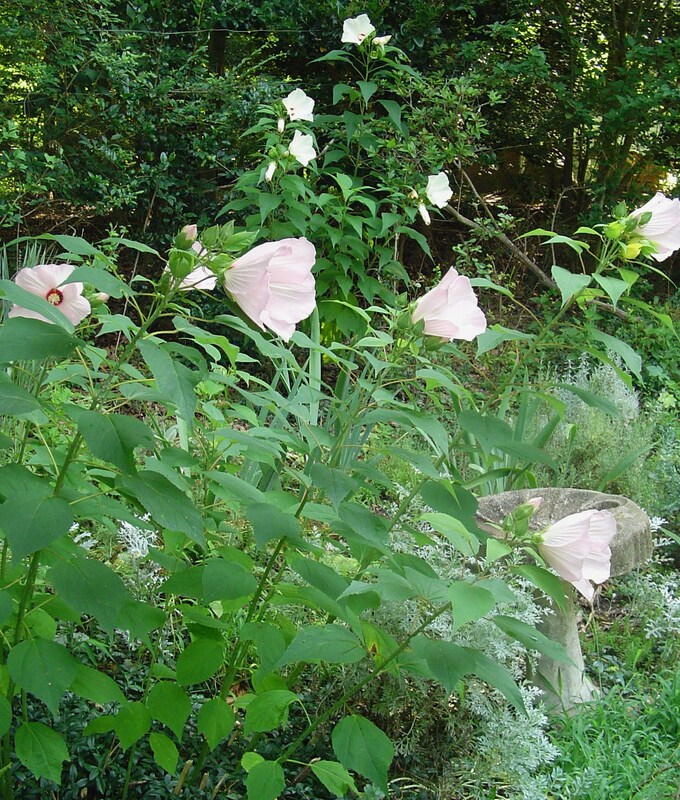 Hibiscus Mutabilis is hardy to Zone 7, and is commonly found in Zones 7-9. It works best in a shrub border as it is inconspicuous when dormant, and quite large and showy in mid-summer. 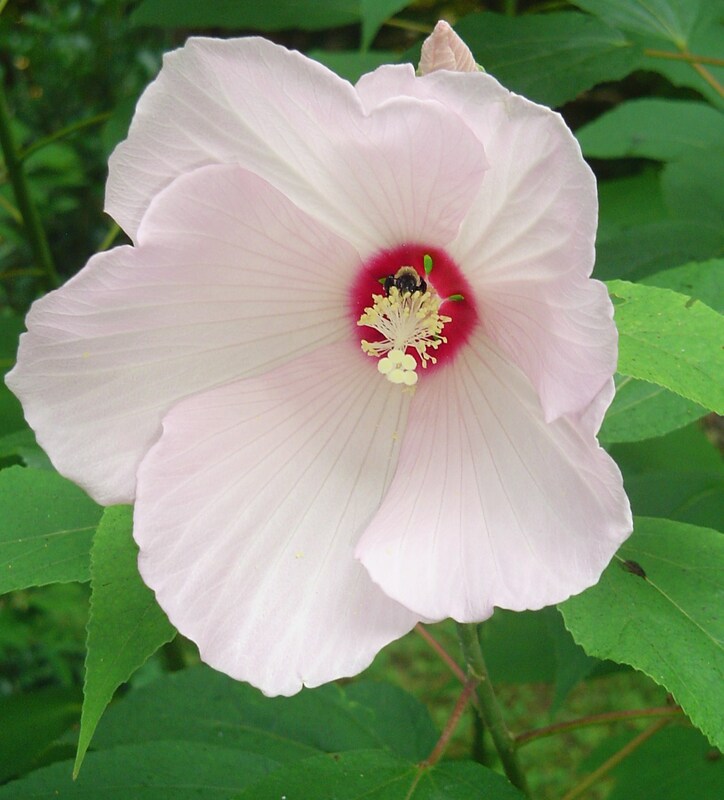 Rose Mallow, or Swamp Mallow, is native to Virginia and naturalizes easily in sunny areas with moist soil. Hibiscus grandiflora has the largest flowers at 8”-10” across. The flowers are a delicate light pink. It is a very large plant topping out at 8’, and prefers to grow in the wet soil of swamps and the edges of ponds. Hardy in Zones 6-9, it sends up new stems each spring covered in fuzzy, five lobed grayish green leaves. 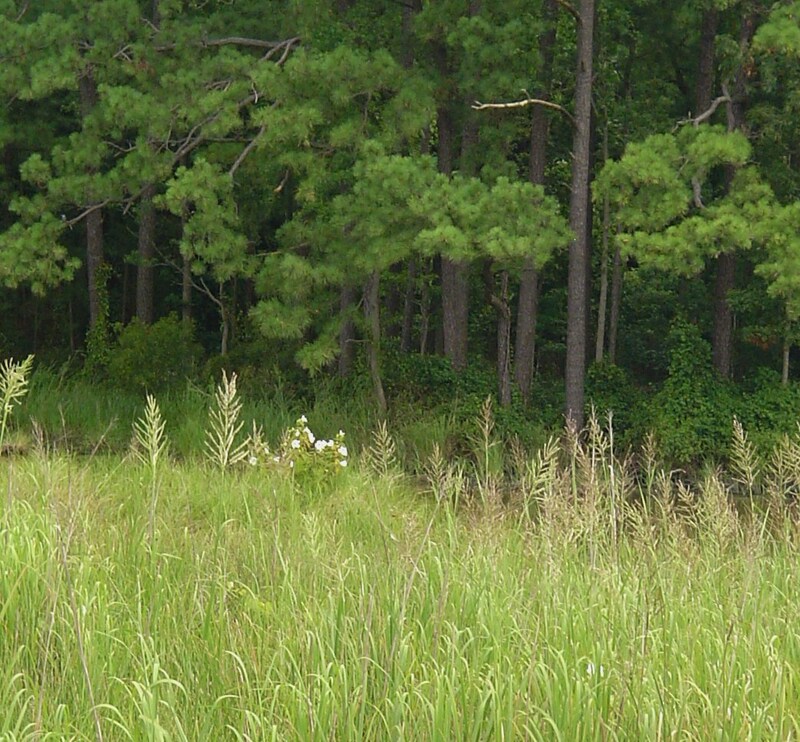 This plant is native to the southeastern United States and is most commonly found growing in full sun in wetlands. 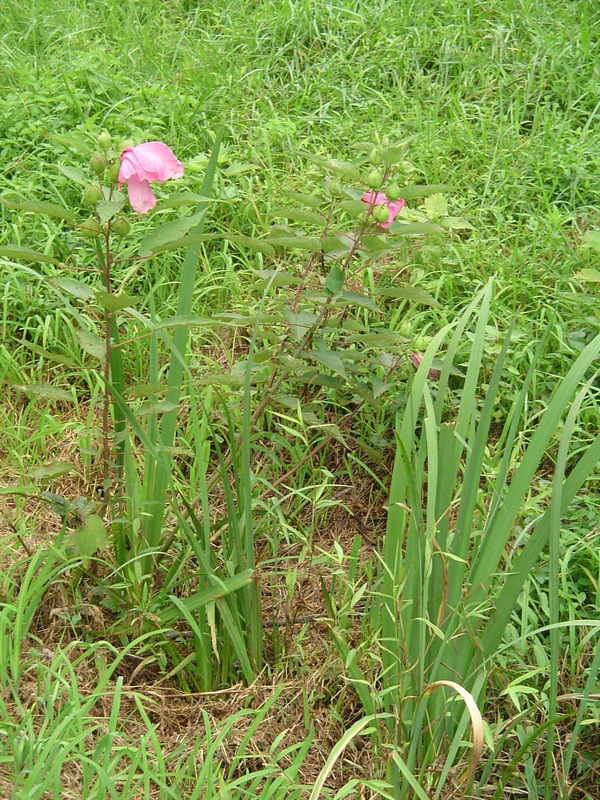 The hardy Hibiscus growing in my garden is Hibiscus moscheutos, also called Rose Mallow or Swamp Rose Mallow. 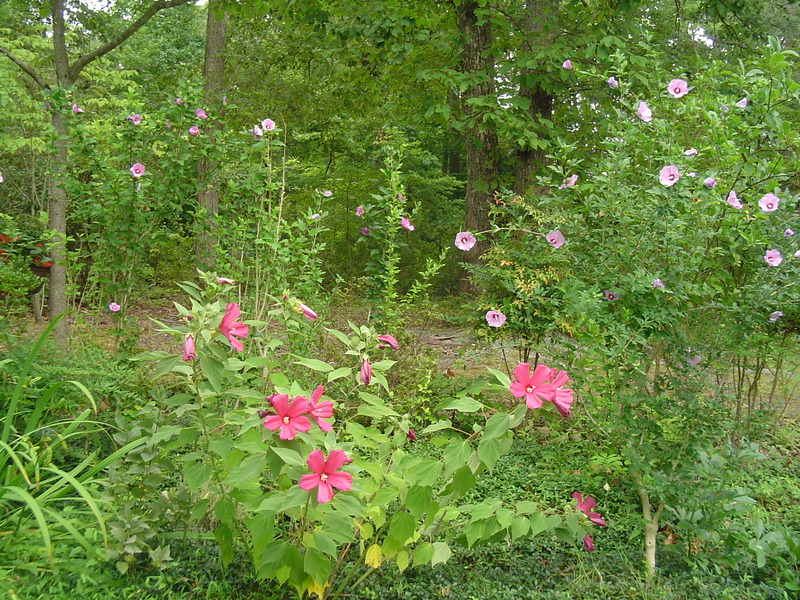 HIbiscus moscheutos growing with Hibiscus syriacus, Rose of Sharon. Numerous stems appear each year in early summer, rapidly growing from the crown, which expands each year. Leaves are heart shaped, medium green, and slightly fuzzy. Plants grow from 2’ to over 6’ high, depending on how well their needs are met. Plants prefer moist soil in full sun, but will grow in drier conditions and partial shade. This shrubby perennial is native to the Eastern United States from the Great Lakes south to the Gulf Coast. Flowers have five long petals, usually with a dark red throat, and come in shades of white and pink. Flowers are generally 6” across and may be 5”-6” deep, with a large stamen and pistols loved by hummingbirds and bees. Flowers open in the late afternoon, and close again in the morning. Many hybrid cultivars are available. To encourage the best performance, water this Hibiscus during dry spells, and top dress each spring with an inch or two of finished compost. The plant does best in moist, rich soil. Collect the seeds once the seed heads open in autumn. These plants readily self-sow in the garden. I cut back the dried stems from the previous year in winter or early spring. 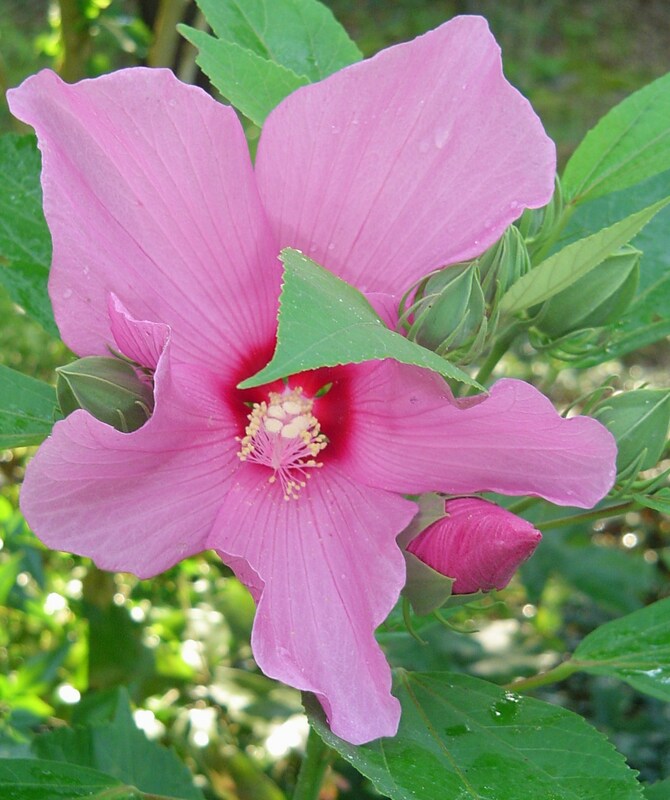 Other hardy Hibiscus plants are available, and those interested might enjoy looking at the selections available from Plant Delights Nursery near Raleigh, NC. http://www.plantdelights.com/searchprods.asp They also carry a number of hybrids with beautiful colors. 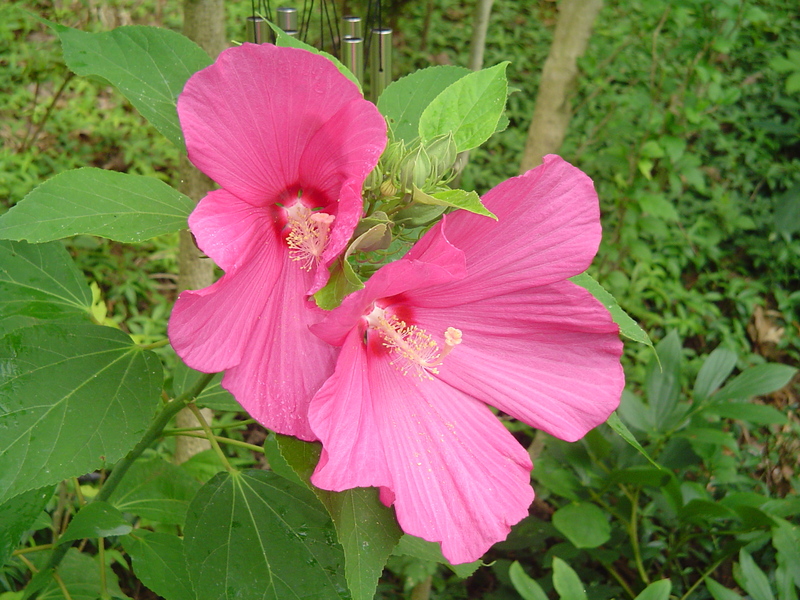 Most online and mail order nurseries carry a number of selections of hardy Hibiscus. Hardy Hibiscus along John Tyler Highway in James City Co. Locally, Homestead Garden Center carries a dozen or more varieties each spring. Several colors are still available now in mid-July, and have been reduced in price. Homestead always has healthy, beautiful plants and a very knowledgeable family staff to help answer questions. 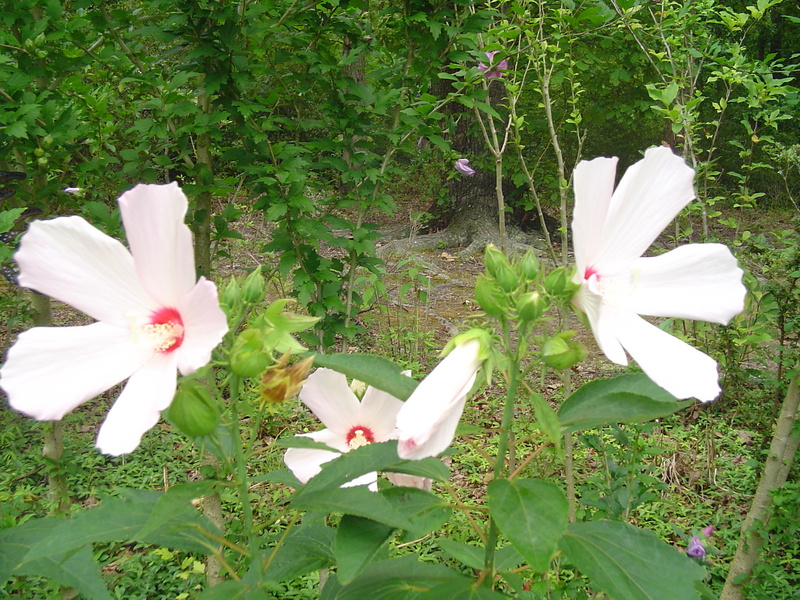 Rose Mallow, or H. Moscheutos growing beside College Creek on the Colonial Parkway. 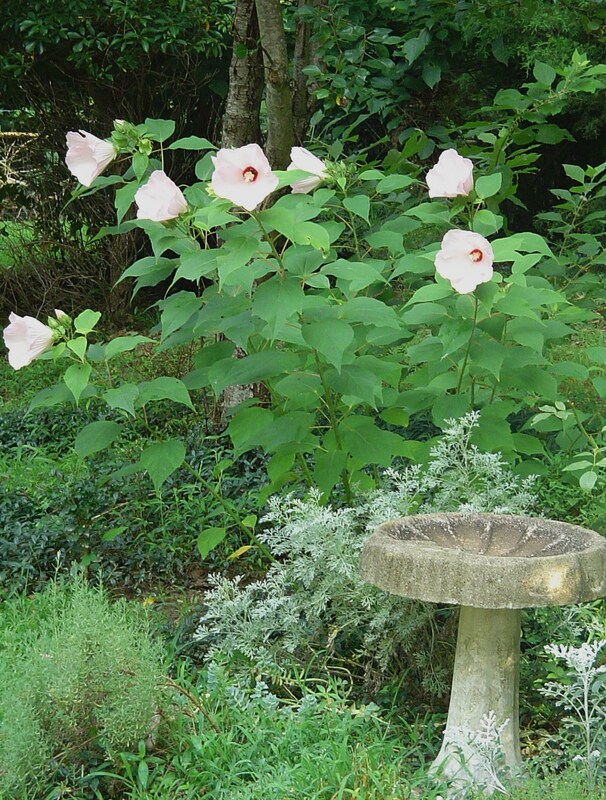 Hardy Hibiscus are tough and forgiving plants, easy to grow, welcoming to wildlife, beautiful in season, and good additions to sunny areas in a forest garden. Hardy Hibiscus growing along the Colonial Parkway near Jamestown. 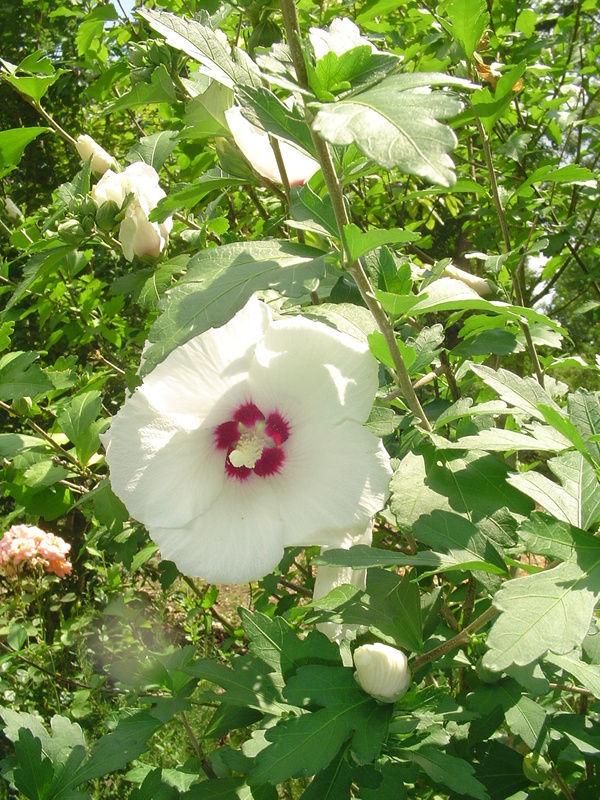 I planted hardy Hibiscus (swamp mallow) in my backyard about 8 years ago. They did very well, until the river birch trees grew tall and made the area too shady. I think they like full sunlight. One by one, my hardy Hibiscus plants died away. I also planted 9 Rose of Sharon on the side of my yard at the same time. In full sun, they are still doing great. I trim them every year, so they have gotten thicker and wider. Quite beautiful. I bought the hardy Hibiscus and the Rose of Sharon because they were on the “Deer don’t like to eat this plants” list. And it is true. I have many deer passing through my yard and they never bothered the hardy Hibiscus or the Rose of Sharon.